Another comic book that was bought for my brother Ken, but which eventually ended up with me. 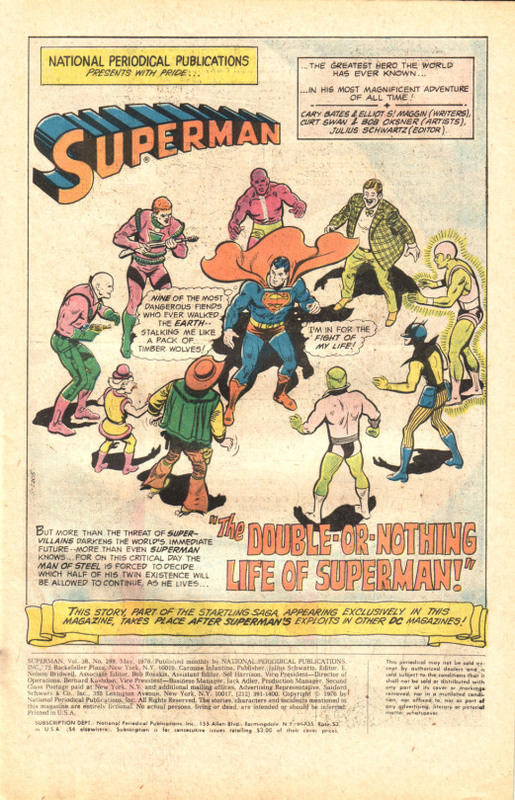 This issue of SUPERMAN was the concluding chapter to a then-unprecedented four-part epic storyline, one that would be collected a couple of times in the intervening years. 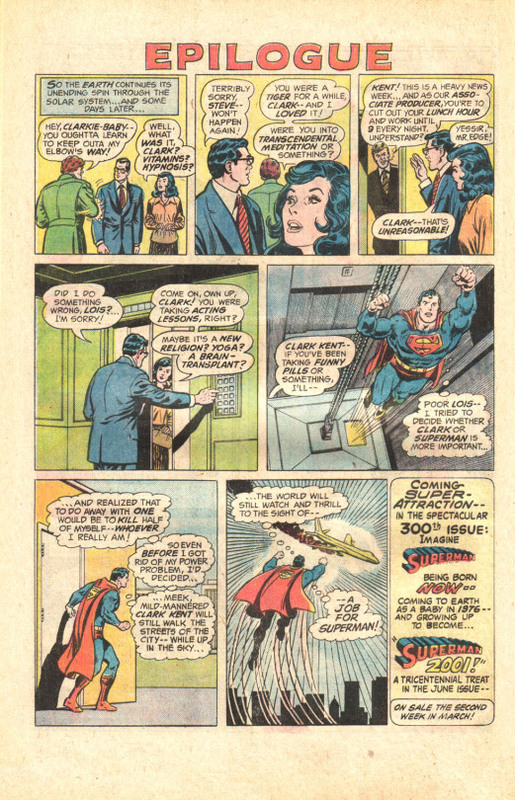 In addition, it wrapped up a subplot that had ben brewing in the Superman titles since the early 1970s. Of course, I didn’t know any of this when the book first showed up. 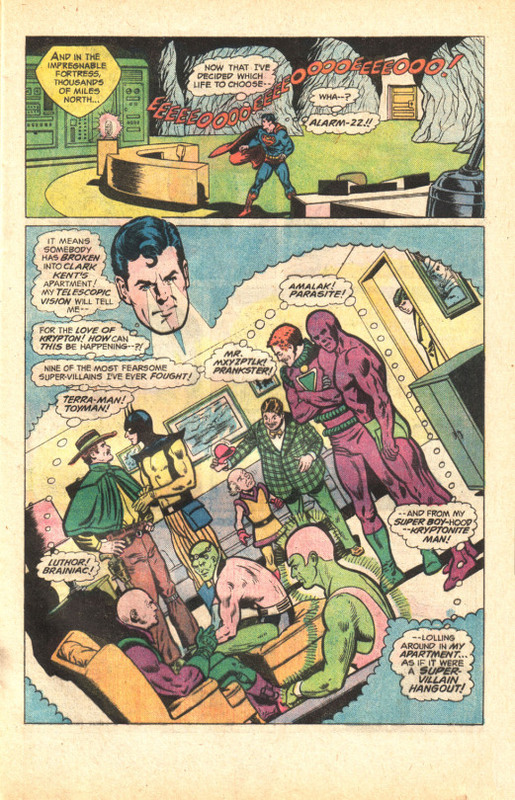 The issue opens with the mysterious Mister Xavier, Clark Kent’s neighbor, recapping recent events for his alien masters, and in reality the readers. Xavier is the long-running plotline I mentioned earlier. He had been introduced several years beforehand as a reclusive figure with a mysterious and somewhat shady background, but while hints had been dropped over the years, his secrets hadn’t been revealed before now. Turns out that–and I believe this story was written before the Hitchhiker’s Guide to the Galaxy–Xavier works for an interplanetary organization that wants to build a teleportation route through our solar system–and to do so, the Earth must be destroyed. This project is so urgent and important that Xavier was placed down on Earth 30 years ago to figure out a way to do it, and he has–by harnessing the destructive powers of Superman. But because this is a Superman story, that plot must be byzantine. So what Xavier has first done is to use his technology to affect Superman such that, when he is in his Clark Kent persona, he no longer possesses any of his super-powers. Thinking that this is being caused by the psychological strain of living a double life, Superman has spent the previous three issues experimenting–living solely as Clark Kent for a week, then solely as Superman, and discovering the benefits and drawbacks to each identity. What this has to do with Xavier’s ultimate plan is vague, but in any case, he’s ready to make his move. Using contrivance crystals, he teleports 9 of the Man of Steel’s greatest enemies first into Clark’s apartment, then across the globe, and when Superman arrives, Xavier charges him with energy, turning him into a living bomb. As Superman expends his energy battling his enemies, he’s burning through the fuse and coming closer to exploding and taking the Earth with him. As Superman races from fight to fight, he’s got another worry–Clark Kent is desperately needed to testify in a court case to convict an Inter-Gang bigwig. 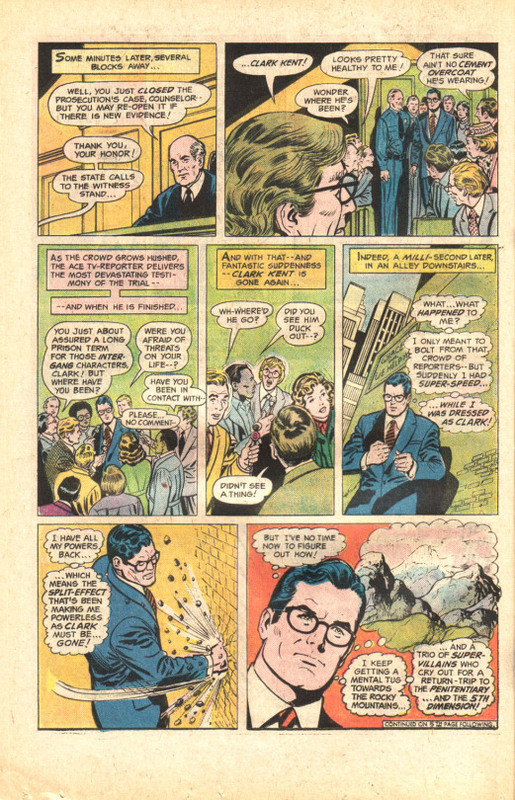 So Clark takes time out from his marathon of villain-bashing to appear as Kent and make his testimony. But this time, he finds that he still possesses his super-powers in his civilian identity! This is a vital clue for him–but he can’t wait, there are still a half-dozen villains at large! Three villains later, and Superman has enough of a breather to check back in at his apartment. And sure enough, he discovers that his regular Clark Kent wardrobe has all be treated to repel the yellow sun energies that give him his powers. 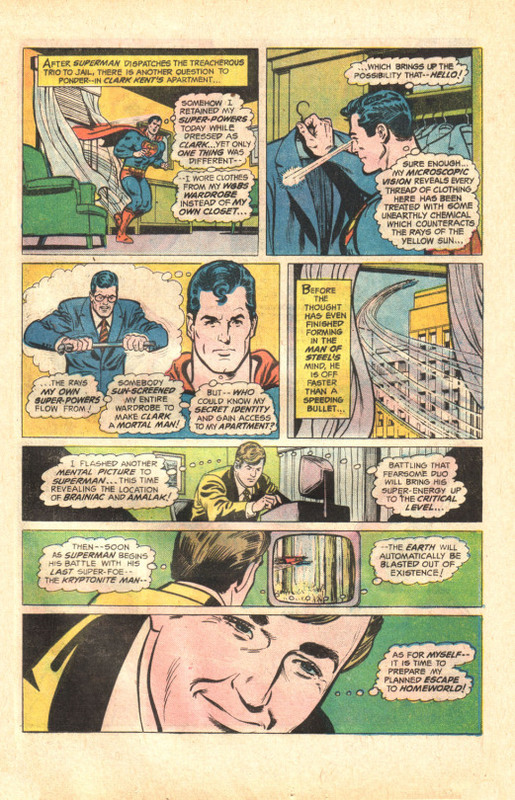 (For his court appearance, Superman borrowed a suit from the WGBS wardrobe, rather than his own clothes–hence, his powers were unaffected this time.) Still, there are three more foes to contend with, and as Superman races off to combat them, Xavier makes his final preparations. 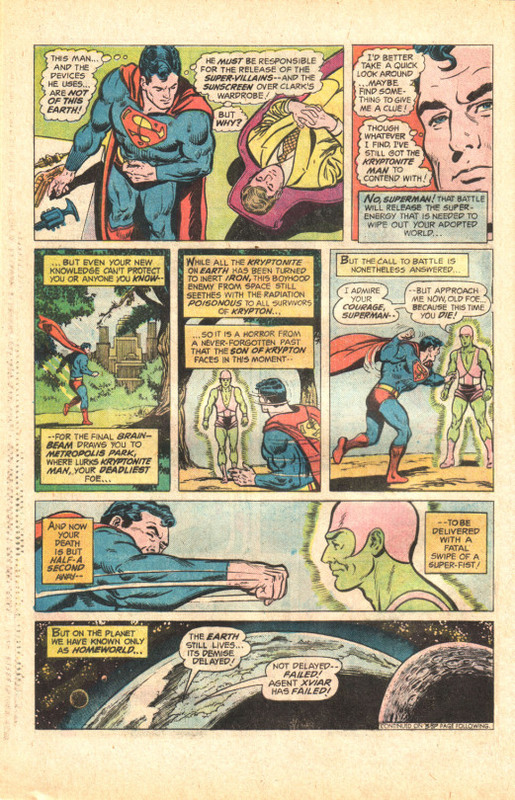 Two more enemies later, and Superman has a moment to use his super-senses to divine the brain-beam that’s beaming him the location of his enemies and follow it back to Xavier’s apartment, where the alien appears to be in a state of hibernation. 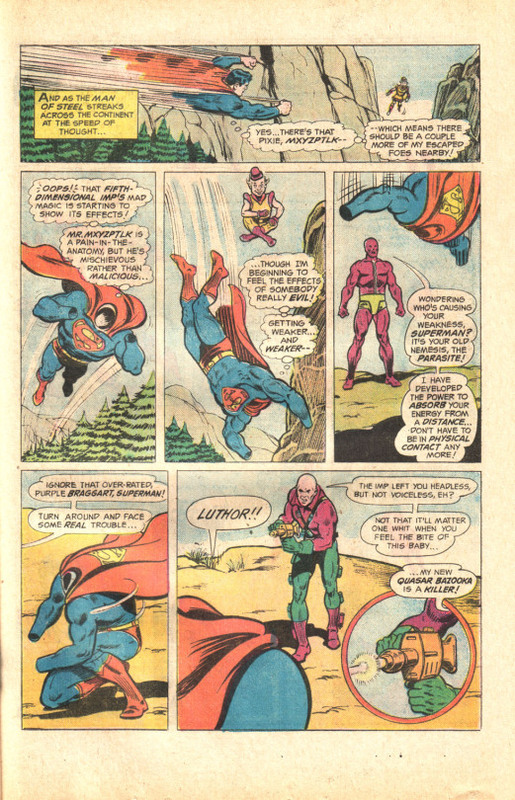 Superman goes off to face his final foe, the Kryptonite Man and dispatches him with one blow. yet the Earth still lives, because Superman was wearing one of his doctored Clark Kent suits underneath his uniform, and struck the Kryptonite Man with only his regular human strength. 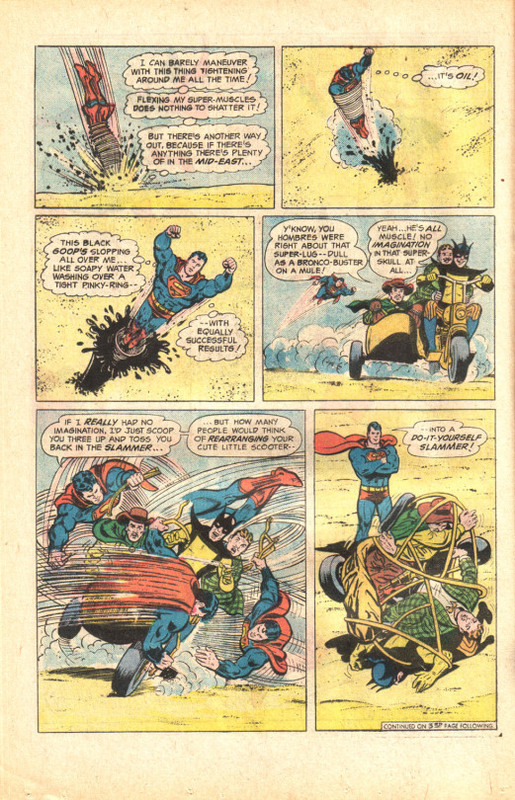 In the wrap-up, Superman captures Xavier, who has pulled a swap with the Kryptonian’s enemy Amalak to affect his escape. But given Xavier’s failure to eliminate the Earth, his people aren’t likely to rescue him. 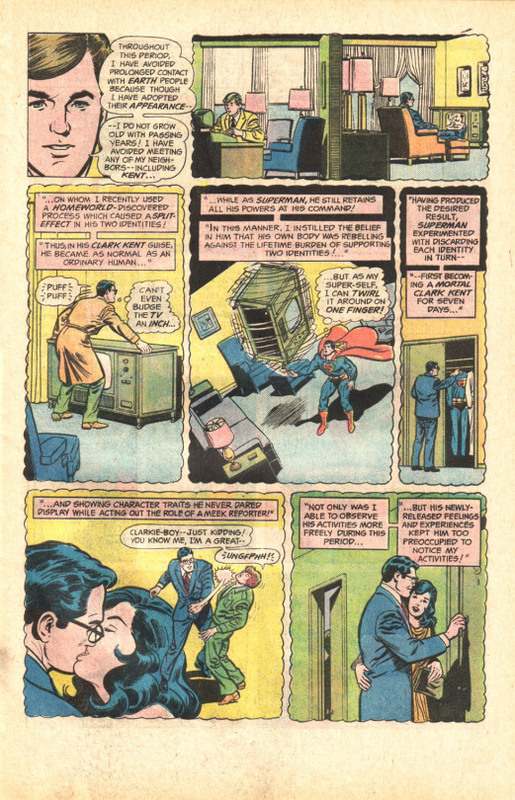 And in a nice epilog, we get the wrap-up to the larger story question of whether Clark Kent or Superman is the more important identity, in which Superman reveals that he’d already decided that, regardless of whatever psychological difficulties it might have caused, he intended to continue to live as both Kent and Superman. 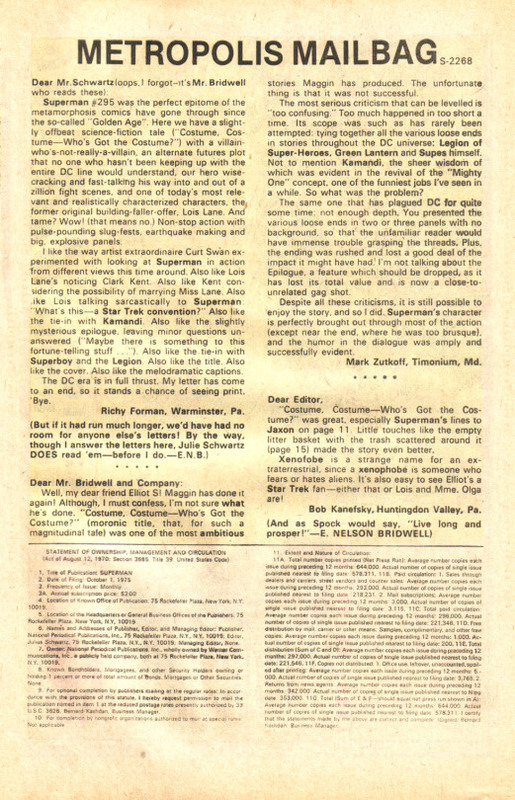 And, like with other titles this month, the Metropolis Mailbag letters page includes the Statement of Ownership, which indicates that SUPERMAN at this point was selling 221,348 copies a month on a print run of 578,311. That’s a 38% efficiency, which is pretty miserable, even with that many copies being sold. I’d imagine that the print run was scaled back for future issues in an attempt to get that percentage number up and not be generating so much waste. This need to print three copies in order to sell one was what had the comic book industry on the ropes for most of the 1970s, and it was only the advent of the Direct Sales network of comic book specialty shops that bought books on a non-returnable basis that saved the industry.